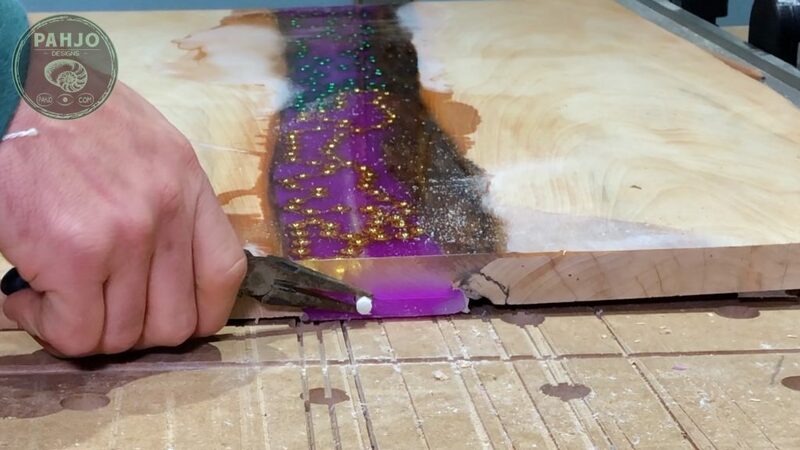 In this DIY tutorial, learn how to embed LED strip lights in Epoxy Resin and easily replace them. 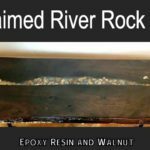 In addition, be sure to visit my favorite epoxy resin tools and material. I received many questions/comments regarding a technique I used to embed LED light strips in resin in this LED wall art project. 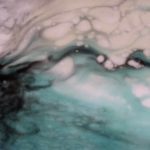 Consequently, I decided to provide more detail regarding the technique. Keep in mind, I use the term ’embed’ in this article as a synonym for submerge, cover, and encase. 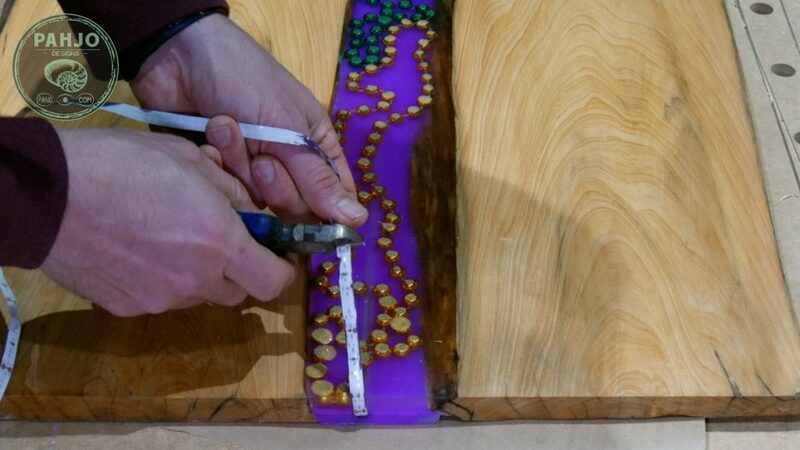 There are many ways to embed LED strip lights in resin. Essentially, I’ve either used or considered using the 3 techniques outlined below. 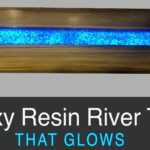 Hands down, this is the best technique for embedding led strip lights in resin. This technique makes it easy to replace broken LED light strips or upgrade LED strip lights to different colors. Furthermore, this technique helps UV LED strip lights to efficiently charge the glow powder. 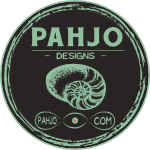 If you are interested in resin glow powder, be sure to visit my live edge beach glow table. Also, the tunnel hides the LED lights from view. Ultimately, creating a hollow tunnel is more difficult than the other techniques. 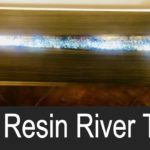 Luckily, this DIY tutorial provides detailed instruction on how to embed LED strip lights in resin using this technique. This technique is widely used because it is simple. Additionally, most LED light strips have an peel-off adhesive on the back. Ultimately, this technique is simple and convenient. 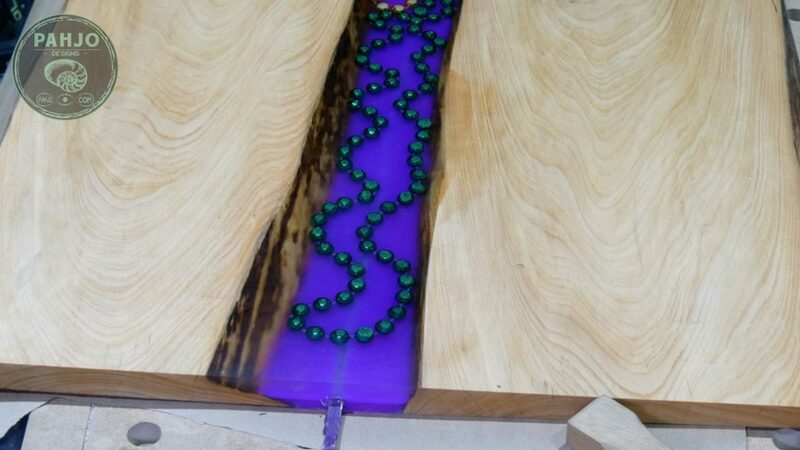 Additionally, this technique can be improved by routing a groove for the LED lights to rest flush with the wall art or table. 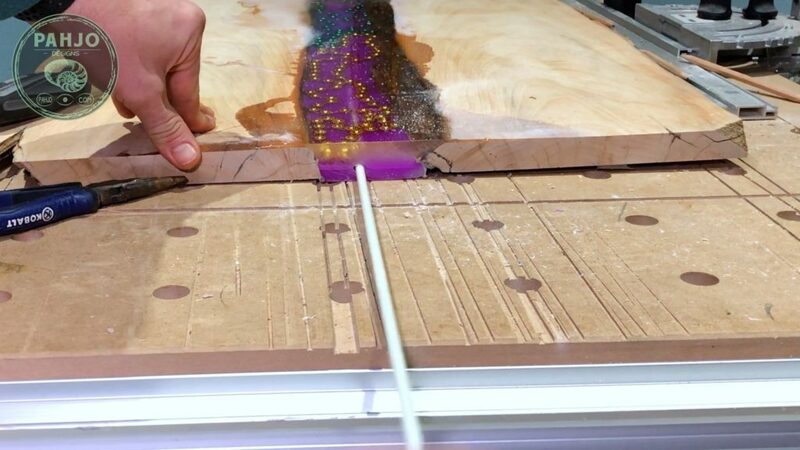 This technique makes attaching LED strip lights to epoxy resin easy; however, it has 2 issues. First, the peel-off adhesive lacks proper strength to hold the LED lights in place. As a result, they eventually come off with time. Super glue can be used to solve problem 1. However, it makes a mess and it is difficult to remove. Essentially, problem 2 solves problem 1; however, it creates an additional problem. Since I don’t recommend this technique, I will only review the cons. 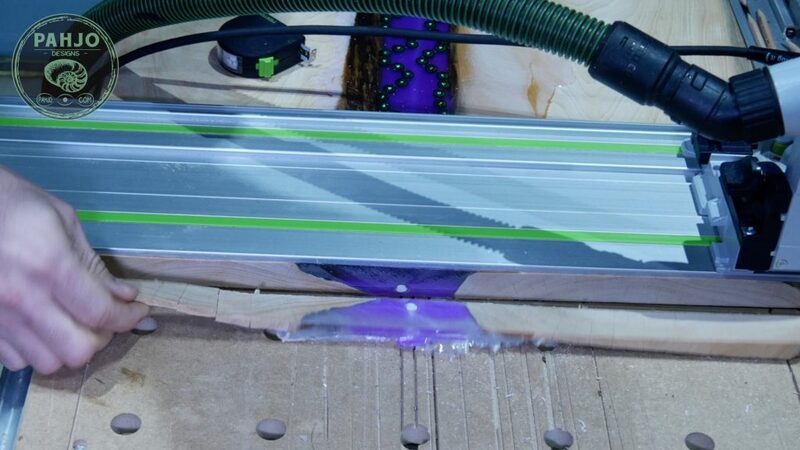 First, epoxy produces heat during the curing process and may damage the LED light strips. Second, it is impossible to replace the LED light strip. First, 1/4″ clear flexible tubing works best. The tubing does not stay straight and prefers to curl. In turn, I recommend to use something rigid to keep it straight. Also, be sure whatever you use is plastic because it will need to be cut in later step. I happen to have an old plastic wire fish rod which fit perfectly..
Then, use hot glue or silicone to seal each end. Next, place the tube in the middle of the wall art. 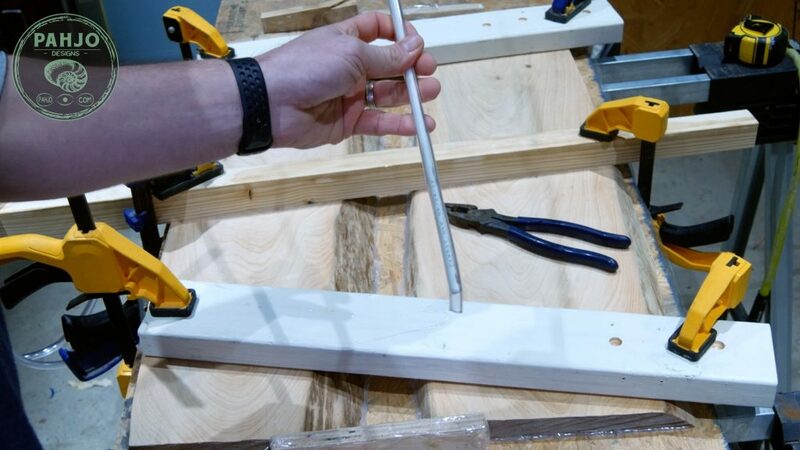 Keep in mind, you will need to trim each end if you install the tube and rod as mentioned above. Often times, folks trim each end anyway to square up the wall art. Therefore, it isn’t an issue.. 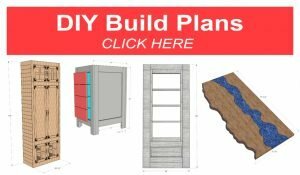 There is an option if you don’t plan to trim each side of your resin project. 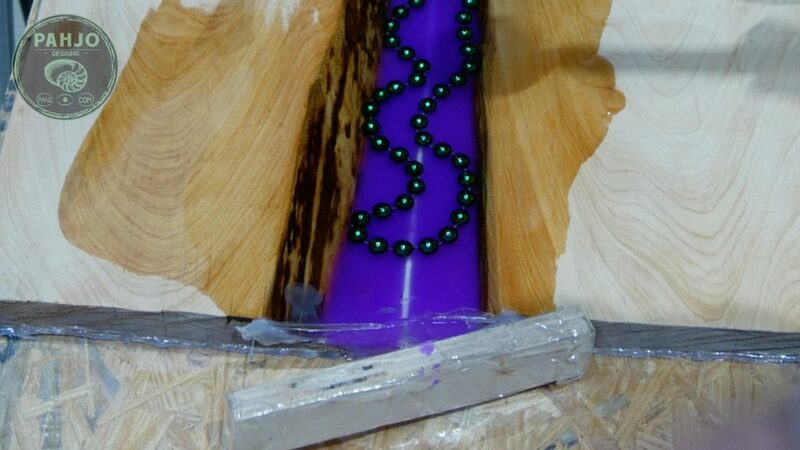 First, drill a hole in the resin mold the slightly larger than tube (3/8″ should work) into each end of the resin mold. The tubing and rod should be roughly 3 to 5 inches longer than the table. Next, slide the tubing through the holes. 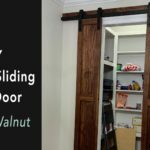 Essentially, this option eliminates the need to seal each end with hot glue and it eliminates the need to trim each end. 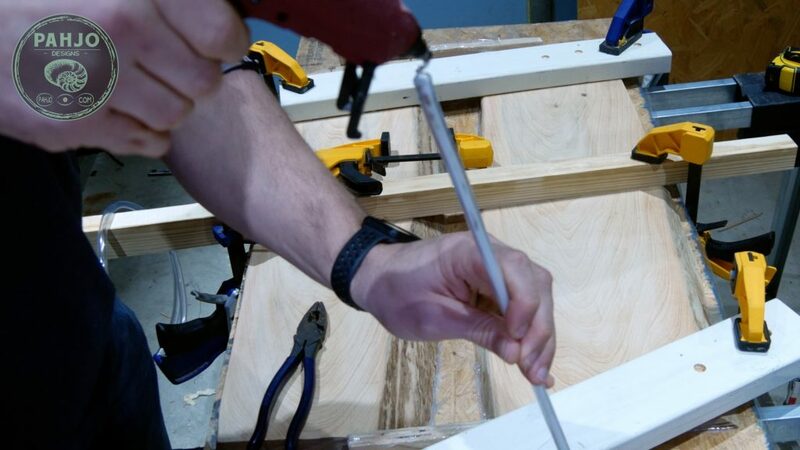 Simply use a razor blade to cut the tubing after the rod is removed in a later step. First, I recommend pouring a thin layer of resin, allow this to cure, and then add the tubing. 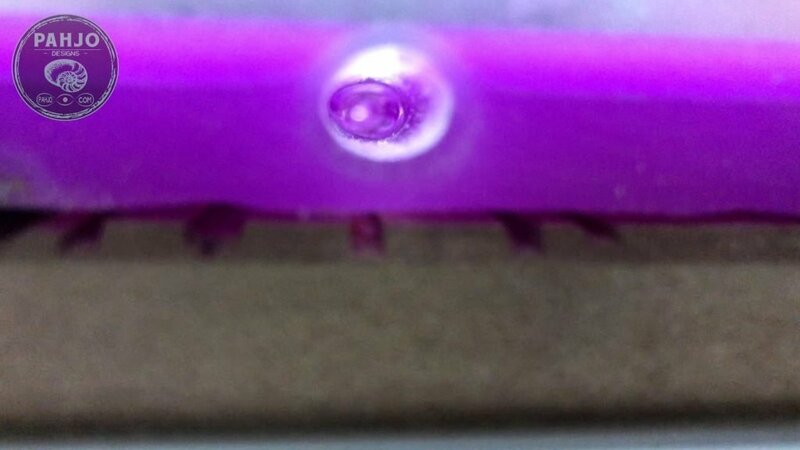 Obviously, you should only do this if you are using transparent resin or to charge glow powder via UV LED Lights. Ultimately, this is a cleaner way to ensure the LED lights are embedded & suspended in the middle of the resin. As you can see from the pictures below, I didn’t do this which caused me to have to paint the back of the LED light strip. This is an easy step. 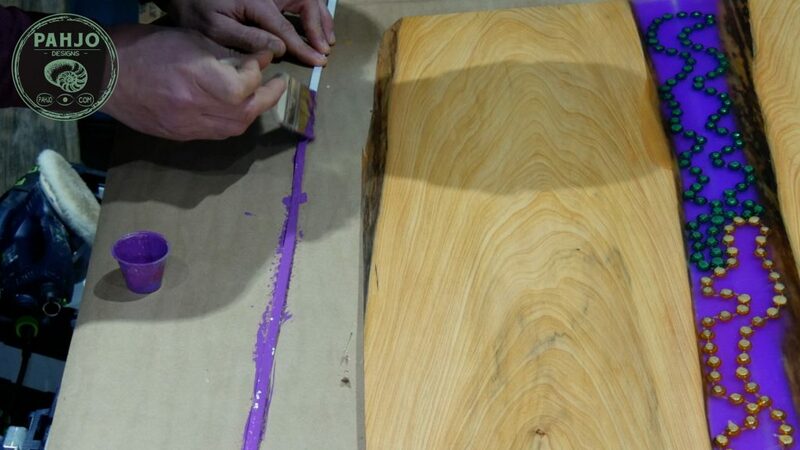 Ultimately, just pour resin as I did for this LED wood and resin wall art. 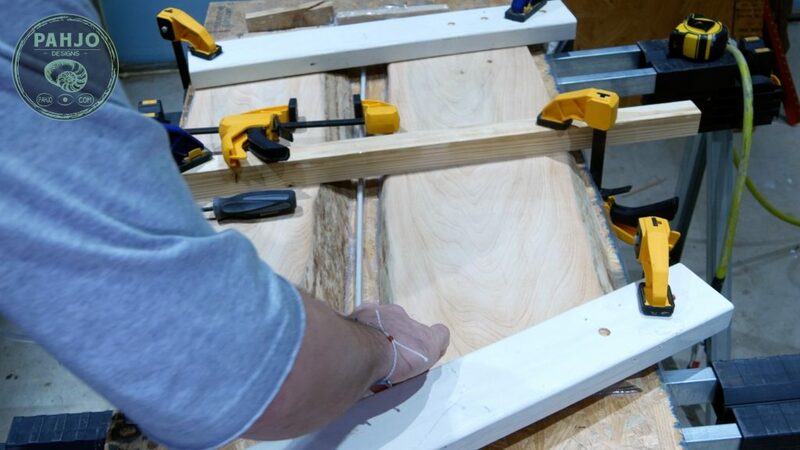 First, trim off each end with a circular saw or table saw. Additionally, make sure to cut the end of the rod on each side. Ultimately, this exposes the rod which makes it easy to remove. Next, expose the rod from the other side by pushing it a little. Then, completely remove it. If you look closely, you can see how I didn’t completely cover the tubing with purple resin. First, inspect the tunnel once you remove the rod. First, tie or tape the led light strip to the rod or device used to keep the tube straight. Additionally, I prefer the LED lights to face down towards the rear of the table. Next, pull the LED strip through the tunnel. Then, cut the LED strips between the contacts. Or, bend it around the end towards the back if it will be powered via a wall outlet. Also, be sure to leave about 5″ in excess to power the LED lights. In conclusion, I hope you learned how to embed LED strip lights in epoxy resin and the pros/cons of different options. Additionally, visit the LED wall art tutorial. Also, please leave a comment and let me know if you plan to try this technique on your next project.